British researcher Kathy Niakin was given approval in February to edit human embryos, but only for basic research. 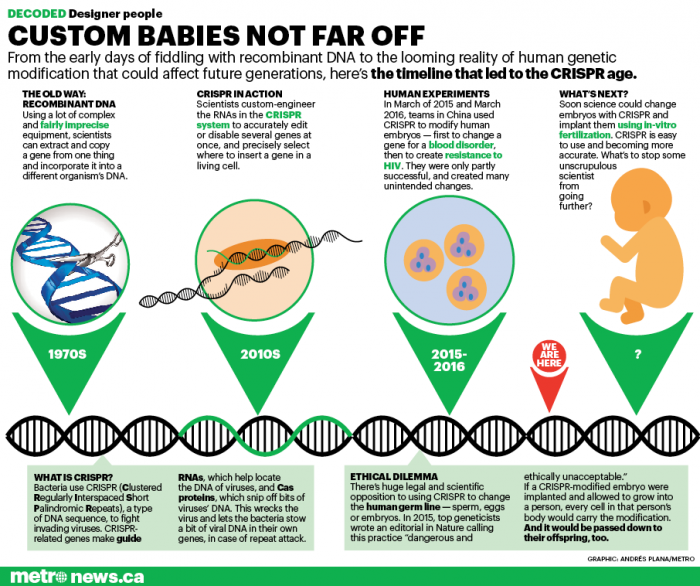 The embryos will not be implanted, and must be destroyed after 14 days. The Chinese experiment involved modifying the patient’s own immune cells to make them more effective at combating cancer cells, and then injecting them back into the patient. The patient will receive a second injection; and the team plans to treat a total of 10 people, who will receive either 2, 3, or 4 injections. The primary purpose of the trial was to test the safety of the procedure. All the participants will be monitored for six months to determine whether the injections are causing serious adverse effects. The team will also be watching beyond the six-month mark to see whether the patients are benefiting from the treatment. The first U.S. CRISPR trial was supposed to be conducted by Editas Medicine to try to treat a rare form of blindness called Leber congenital amaurosis. The condition affects only a few hundred people in the United States. The fact that the trial will occur in cancer patients instead suggests that CRISPR might be used against common diseases sooner than originally thought. June is the scientific adviser for the impending U.S. trial, which is expected to take place in early 2017. In March 2017, a group at Peking University in Beijing hopes to launch three clinical trials using CRISPR against bladder, prostate, and renal-cell cancers. However, those trials currently lack approval and funding. It’s going to be a disaster. Given the feedforward feedback loop of genes and the environment all the patient has to do is eat the wrong foods or go into an area where one of any number of environmental factors set off other genes that could completely wreck havoc on their health.